Little Bit Funky: random questions. Yes, YOU can make this quilt we are making. Yes, I cut out all the letter that I use for pillows and banners. I think the secret to the gravy was using the potato water...I just took the meat out of the pot, added some potato water, stirred it us, scrapping the sides of the pan to get the good bits, added some flour and brought it to a boil. Doug loved it...I hate gravy so I didn't even have any. Lang bo Norge! means Long Live Norway! Any idea how much fabric (yardage), I should get for the BACK of the quilt we are working on? I love your new header! Very cute! Love the new header too. Also love the pictures of your family. 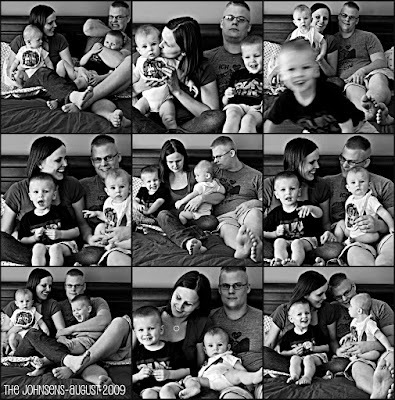 These are such fun family pictures! Did you use a timer? It makes me want to take some family pictures of my own. You guys are adorable. sure, i would like your birdie to be a button i can put on my blog... is this possible?